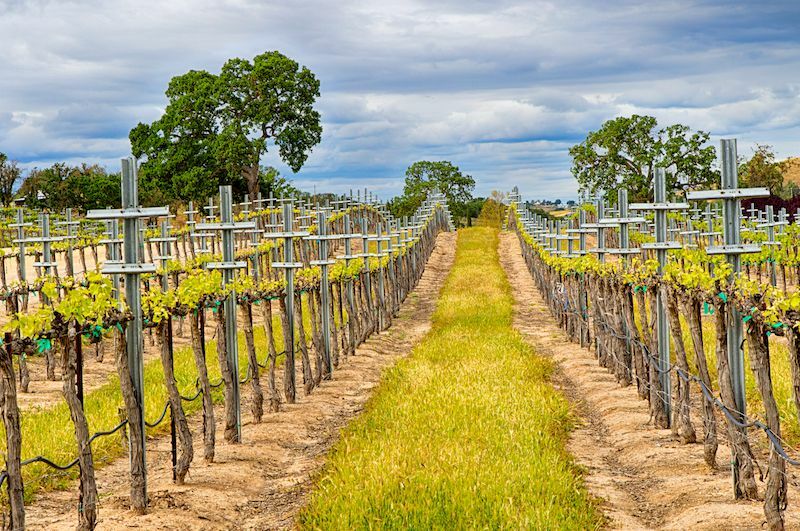 Known for award-winning houses such as Turley Wine Cellars, plus a collection of about 300 small and mid-level producers, this under-the-radar wine region 20 minutes from California’s central coastline is fast becoming known for its distinctive wine styles and down-to-earth scene. For large groups, Halter Ranch’s hilltop tasting room and outdoor fire pits are perfect for catching up over a glass of their stellar grenache blanc. For those looking for something a little different, at Castoro Cellars, you can taste their fine Spanish, Italian, and French-inspired blends while playing an 18-hold game of disc golf through old growth oaks. Rejuvenate in a mineral water bath from the hot springs at the Paso Robles Inn or book the farmhouse guest cottage at boutique vineyard Pelletierre Estate for comfy and cool accommodations overlooking the beautiful Willow Creek district in the heart of Paso Robles west side. The centrally located and easily walkable town square is home to dozens of small boutiques, independent coffee shops and locally-sourced cuisine, such as The General Store, Kreuzberg Coffee Company, and Thomas Hill Organics. Fans of resort spas such as Canyon Ranch and Miraval will be amazed by this next-league resort property set in the luminous canyons of the Utah ​desert. Aman Resorts are known for fitting entirely within their environment, and this one is no different. The property is situated right amid 600 acres of undeveloped land in the heart of the Grand Circle, which is home to Bryce Canyon, ​Grand Canyon, Monument Valley, and Zion National Park. Those in need of restoration and relaxation will find both with a stay in the Suites, each featuring an outdoor lounge and fireplace and The Spa, focused on restoring hózhó, which means restoring beauty, harmony, health, and balance in Navajo. View the changing colors of the desert up close on a guided hike, or from a distance in an early morning hot air balloon rides overlooking Lake Powell down below. After a cultural tour and storytelling journey with the Navajo guide, you and your friends won’t just be catching up, you may be inspired to come back all new women. Since Hurricane Sandy hit the New Jersey coastline, things have been tough for this Atlantic hotspot. That may be changing thanks to a $14 million investment coming to The Borgata this summer. The shoreline casino hotspot is sure to rival even the hardest to get into Vegas pool scenes come summer, thanks to a new 18,000-square-foot mega club Premier to replace Mixx and Mur.Mur and a 50,000-square-foot outdoor pool deck. Those who want to be in the middle of the action should stay at The Water Club, the sleek sister property to the Borgata. The Immersion Spa is the best in AC and has a very relaxing private lap pool and relaxation lounge, perfect for nursing hangovers and catching up on the latest gossip. We suggest throwing it back and getting tickets for one of the outside concert series shows at Festival Park, which has killer acts like, well, the Killers. If you can score reservations, The Chew host Michael Symon is set to debut his authentic Italian eatery in the fall. Okay, it may not quite be the same size, but Puerto Rico’s old San Juan has a little taste of everything you’ll find in the Big Apple: Amazing dining, shopping, and nightlife that heats up all hours of the night. The swanky Vanderbilt Condado, about 20 minutes from Old San Juan by taxi, is a perfect perch for a girlfriend trip. It features an infinity pool, farm-to-table menu full of delicious light fare, and out-of-this-world spa with full Turkish Hamman Experience in which you are bathed, scrubbed, and wrapped up to an out-of-body state while ensconsed in an egg-shaped treatment room atop a marble altar. Explore Old San Juan’s hidden highlights such as Pure Soul boutique, Alfresco Rooftop Wine Bar, and craft beer speakeasy La Taberna Lúpulo. Take day trips to the western part of the island for rain-forest hikes and kayak trips in the bioluminescent bay. Then come back for the ultimate party scene at Mist at the San Juan Water Beach Club Hotel. Foodies and craft beer lovers can think outside the Portland and Williamsburg box with a visit to this fairly well-known, yet under-the-radar coastal town. It has been benefiting from the effects of the Williamsburg, Brooklyn and Portland, Oregon, exodus over the past few years with a slew of surprisingly inventive offerings for the once sleepy shipping port. You can barely walk a block without passing by a brewery or foodie favorite, so get your bellies ready to chow down at spots like Duckfat, for, you guessed it, amazing things fried in duck fat. Or have a seat at Eventide Oyster Co. for some of the best local seafood with Asian influences, such as its brown butter lobster roll in a Chinese bun. It wouldn’t be a trip up East without a stop at local favorite Shipyard Brewery. In a speak-easy-like basement space, Barreled Souls Brewing Co., offers a sampling of small batch, oak-barrel fermented beers, such as Space Gose and “breakfast beer,” which doesn’t sound bad at all after a night out with the girls. This bite-size city has just the right amount of activities to fill up a weekend, including a pedestrian-friendly downtown shopping district with excellent local fashion and gift shops filled with small designers coming out of nearby Rhode Island School of Design. Thanks to nearby chef training school Johnson & Wales and its close proximity to notable farms and fresh-caught seafood, the dining scene is on the rise, with restaurants such as Gracie’s, and French bakery Ellie’s, dotting downtown. The lack of investment in the 70s and 80s has worked to the city’s advantage with a downtown that still has its turn-of-the-century charm, including the Dean Hotel, whose prohibition-era design gives nods to its previous life as a bordello. Cocktail culture isn’t running dry either with the Dorrance in an old bank building. Music and art fill up the rest of your weekend, and if you can swing by during WaterFire, its fun and festive springtime festival of music and art, where hundreds of braziers are set ablaze along the waterfront at night to foster community. For a great breakfast the morning after, Black Eyed Susan’s has perfect diner-style pancakes and omelettes. CurrentVintage has great original finds, or if you want to go Island-style all the way Lilly Pulitizer’s flagship store has almost every single item in its catalog. You may know Nassau from your childhood family cruises, but there’s another whole side to this very convenient and relatively affordable Caribbean hub—its many hidden cultural downtown gems. You just need to know where and how to look. For a truly Bahamian hotel experience, book a stay at the Wes Anderson-esque Graycliff where Italian father-son owners have created an extremely special village. Think: on-property saltwater pool, homemade chocolate truffle shop, five-star restaurant, pizzeria, gift shop and colonial history museum—not to mention a cigar bar for late night flirting with the local well-connected crowd if you so desire. (Hint: ask for a tour of its wine cellar downstairs for some of the oldest vintages in the world.) During the day, Tru Bahamian Food Tours’ Bites of Nassau Tour will show you the riches this collection of islands offers. It will also give you an insightful dose of politics and history of the city from its extremely knowledgeable and passionate founder and island local Alanna Rodgers. Later on, take a taxi to Paradise Island for the afternoon and gossip poolside over strong drinks at the adults-only poolside bar Cain (think Vegas) at The Cove Atlantis.